It's a typical day in Germany during the winter and just like the dull and dark colours of the sky during this season, the cars come in murky hues. But the machine I am driving today stands out from the rest. It's bright, yellow and has just received an update. 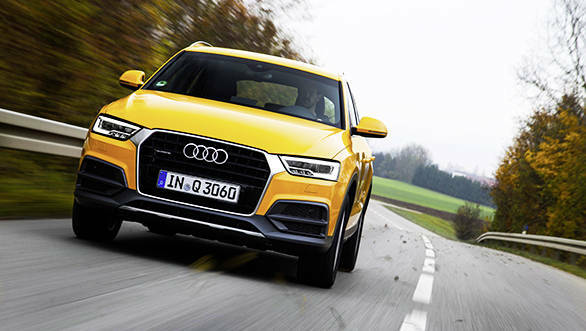 Say hello to the new Audi Q3. The SUV has been highly successful around the world including markets like India. There have been a lot of new variants that have been offered over the years but the next Q3 will be the most significant since 2011. Early next year, Audi India will introduce the refreshed Q3. Is it a much improved version? We find out. The Q3 receives new styling, updated engines and a few more features. Look closely and you will notice that the front and rear end look slightly different, especially the face. The headlamps, for instance, are now LED powered while the standard model gets Xenon lighting instead of a regular halogen bulb. The signature parking and daylight running LEDs follow a new pattern that looks a lot more mean in the dark. The other addition to the lamp is the inclusion of dynamic turn indicators similar to the more premium A8 and R8. While the outer design of the headlamp is the same, the front grille and bumper are all-new. The hexagonal grille is different as well, the upper-sides now merge with the headlamp giving the SUV a new identity. The extension that connects the grille and the lamp looks like it's finished in aluminium instead of chrome, very classy indeed but contrasts well only on cars in darker shades. The air dams and lower grille are sportier and add to the styling. There are two trims to choose from, Design Equipment and Sport Equipment. The side profile is exactly the same, the wheels feature a new design pattern. The rear end does look like it has received no change, but look closer and you will notice a new LED tail lamp featuring a different light pattern as well as a revised bumper. Step inside and the cabin feels very similar to the current Q3, the only visible change is the new steering wheel, instrument cluster and the updated MMI system. The SUV now features Audi Connect that basically uses data using a dedicated SIM card and turns the car into an internet hotspot. Navigation, for instance, uses the connection to load map data from Google maps. Cabin space and quality of materials used is still impressive. Based on the trim level, the inserts on the dashboard, door pads and centre console vary. Audi says that all engine options for the Q3 have received updates. Performance and efficiency has improved while emission levels have decreased. There are many engines available internationally but we decided to drive the India relevant, diesel Q3 featuring the 2.0 TDI motor. Since efficiency has improved, the variant is now named the TDI Ultra. Power has increased to 181PS while 380Nm of torque remains the same. The S tronic dual-clutch transmission continues to offer seamless and quick shifts. Audi engineers have even worked on the gear ratios. This engine option features the Quattro all-wheel drive system and it will make it to India too. The non-Quattro variant will continue to feature the detuned 2.0 TDI and a manual six-speed transmission. The motor, however, produces 148PS and 340Nm, up by almost 8PS. 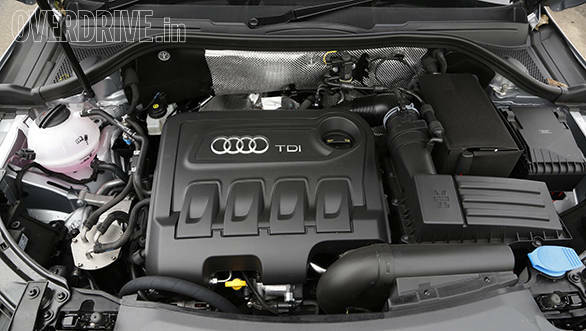 The 2.0 TFSI petrol motor also receives updates and we hope Audi India offers this capable petrol Q3 as well. We drove the Q3 2.0 TDI Quattro and immediately felt the difference. The motor is now more refined, easily one of the best in class. Power delivery is linear and the transmission is tuned perfectly with the updated engine. Driving on the Autobahn, triple digit speeds were reached effortlessly and the engine hardly felt strained even at speeds above 160kmph. 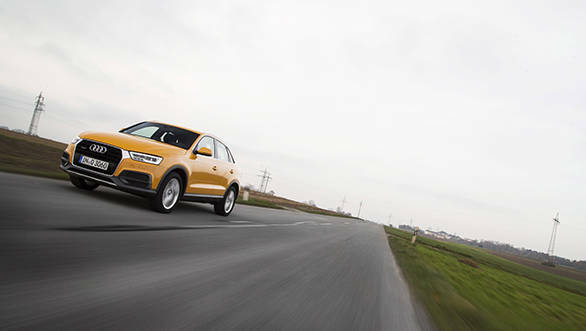 The Q3 is known to offer a good balance between ride and handling. The updated model retains this quality. Obviously, the roads aren't like the ones in India but expect good ride quality from this SUV. The Quattro system aids dynamics while high speed stability is still very impressive. The suspension setup is exactly the same as before. The SUV is now more powerful, offers more features and at the same time, retains the good qualities of the previous version. There are more colour options too, but we aren't sure at the moment if these shades will be offered in India. The new Q3 will be out in India early next year and we expect prices to go up only marginally, so if you are out there looking for an entry-level luxury SUV, we suggest waiting till early 2015. 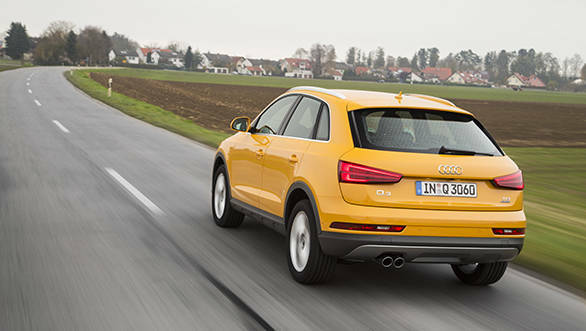 Also see our image gallery of the 2015 Audi Q3.